March 25, 2015 – Lockheed Martin has purchased a wind tunnel that is one of only two of its kind in the United States, and is planning key improvements to the facility. 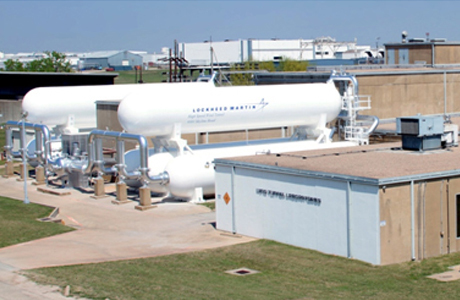 Since 1958, Lockheed Martin and its heritage companies have used the High Speed Wind Tunnel (HSWT) in Grand Prairie, Texas, for subsonic, transonic and supersonic research-and-development testing. Although the company is the long-time operator of the HSWT, it has leased the facility from Triumph Aerostructures. The purchase will enable Lockheed Martin to invest in upgrades and manage scheduling, including testing by other companies and government agencies. The HSWT and a facility in Missouri are the only two polysonic (subsonic-transonic-supersonic), adjustable Mach-number wind tunnels in the U.S.
Products developed in the HSWT include the Multiple Launch Rocket System, the Guided Multiple Launch Rocket System, the Army Tactical Missile System, PAC-3, PAC-3 Missile Segment Enhancement, the A-7 Corsair II and the Space Shuttle. The facility routinely supports programs for NASA, the Missile Defense Agency, the Office of Naval Research, DARPA and numerous U.S. aerospace companies. Planned improvements include a new air-compressor system, which is projected to reduce operating costs significantly, an updated data-acquisition system and the upgrading of utilities.